UPDATE: According to BBC, doctors say they have removed a bullet from Malala Yousufzai, 14-year-old girl who was shot in the head by Taliban gunmen in the Swat Valley. She is now in stable conditions. Gunmen attacked Yousafzai in day light on October 9, and also injured two other girls as they left school for home. Tehrek-e-Taliban Pakistan accepted responsibility of attacking her and a spokesperson told media that she was responsible for anti-Taliban propaganda. 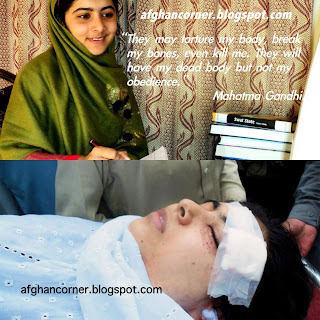 Malala reached to fame when she started writing a diary for BBC Urdu service about Taliban crackdown on girls' education. Afghan-American artist Aman Mojadidi calls himself “Afghan by blood, redneck by the grace of god.” Playing off his two identities, the TED Fellow's bold, funny, thought-provoking artwork explores jihad, gangsterism, consumers and corruption in modern Afghanistan. Aman Mojadidi makes bold art from his two identities -- as an American and an Afghan. Afghan President Hamid Karzai says he will be honored if actor Ben Kingsley to play him onscreen. “Do you ever think about a movie starring Ben Kingsley as Hamid Karzai?” In a rapid fire round of questions, CNN’s Wolf Blitzer asked Karzai in an interview on Monday. “Ben Kingsley, the person who played Gandhi ? He is a great actor, and I would be very happy and honored if he took that role," Karzai replied.